The Book Chook: Where Do You Read? Reading is escape. Everyone has times in their life when they want to be distracted or entertained. Sometimes, the problem can be escaping to somewhere you can concentrate on reading. When I was a child, I would read under the lamp behind our sofa. I was so quiet and hidden, I became invisible, and missed my bedtime curfew. Videogames beep, but books are silent. When my parents finally noticed me, I was sent to bed. There I huddled under the covers with my book and a torch. This was an extra source of warmth in winter, but tricky in summer, when I needed a snorkel for breathing. Another favourite place to read was halfway up our huge jacaranda tree. Next-door’s mulberry tree too - it was a leafy cave, and very handy when hunger nudged. That no doubt explains purple stains on some of my childhood books. When my son was a toddler, I would take my book to the littlest room in the house, and be “vewy, vewy qwiet…” Perhaps it was the closed door that gave me away? When I found him under my bed reading one day, I realized the wheel had turned full circle, and rejoiced that we shared the same reading gene. I love that reading is so portable. Print books can be stuffed into backpacks, audio books take up very little physical room, and several e-books can fit into a pocket-sized space. I always have something to read packed in my bag, even for a short trip to the store. When I go on holiday, my packing order is books: first; clothes: if I remember. That portability has enabled me to read in planes, trains and automobiles, on the Great Wall of China, and once while resisting anaesthetic before an operation. In short, I don't care where I read. But I'm eternally grateful that I have the glorious gift of reading. I also love to read anywhere. But, these days, I'm doing a lot of reading while waiting to pick up the kids- after school, after practices...in my car! I love your packing comment - books first, clothes second. When I left home I had two suitcases - one contained my clothes, cutlery, manchester - just about everything; the other? Full of books. And that's about the way it still is when I pack too. The place to read my tales and other books is my sofa and in silence. At the very first moment I need intimacy to enjoy my readings and images. i found your beautiful blog via miss O's blog. i had to fly over here and check it out. what a gorgeous blog! i am a librarian in a middle school. more importantly, at home i read to my boyfriend's 3 year old grandson. we have a blast together. Recent blog post: "New York Reads" Grant! These days I read mostly a) in bed; b) on airplanes and in airports; and c) on my couch. But when I was a kid I read in the car (for even the shortest of drives), up in a tree in my yard, on the roof of our house (love those dormer windows), and on a raft in the lake (you have to swim with one arm holding the book up, it's a bit awkward, but worth it). I wish I had photos of some of these reading locations... And I might need to do a post of my own on this now. Fun stuff! Sounds very much like me, Lucy. I actually look forward to appointments that keep me waiting, because it gives me a chance to get further into my book. Recent blog post: Where Do You Read? I would hate to tell you how often I have had to pay excess at airports for that very reason, Sandy! 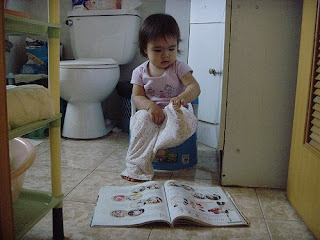 Stel.la, it sounds like you definitely have a special reading place - lovely! Welcome to The Book Chook, Chris. Librarians are my heroes, and three-year-olds have a very special place in my heart. How wonderful that you get to read together! Oh Jen! I wish I could draw - I have such a vivid mental image of young Jen swimming to the raft, holding a book aloft! I love to read anywhere as well, but my absolute favorite place is the beach. When I'm not watching my kids jumping around in the waves, I love to sit under my umbrella with my book. I always pick something a little bit "lighter" in the summer, and it's so relaxing! Anyway, I love how you worded your post. The part about needing a snorkel was very funny! Yes, beach reading IS lovely, so long as you can keep sand away. Reading in a hammock under a shady tree is nice in summer, too. Although I learnt very quickly I cannot afford to jump into the hammock too enthusiastically! We read in bed every night. I refuse to have a TV in my bedroom for this reason. I love to read in the tub too. And on the beach. Sigh. Anyplace is my place to read, but in the summer I have to admit that my favorite place is in the pool by the waterfall in the shade of the palo verde trees. Recent blog post: It's Time for...Friday Feud! I can recognize the signs of a true reader coming through for sure! Cathy, that sounds idyllic. I'm not even sure what palo verde trees are, but I'm off to google to find out.